“Let us rejoice and be glad and give him glory! There is something about the Christian life that is similar to engagement. It is tentative. Or, we could say, incomplete, even unsatisfactory. I have sat with engaged couples over the years who had begun to question their intention to marry. They were usually dismayed at this but my counsel to them was that this is what engagement periods are for. An engagement period is supposed to be a time of searching and testing, a step toward the public promises of marriage. It is not the time of fulfillment and it may be the time that leads to the decision to go separate ways. So now in this life we live in faith and hope. Our love is immature. 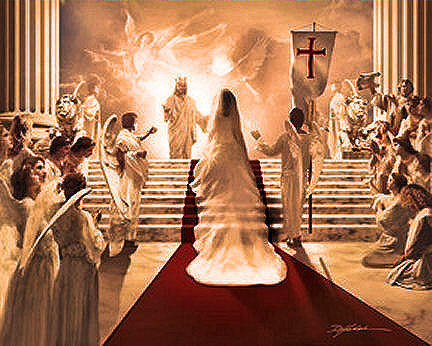 But when Christ Jesus comes again, when the Bridegroom comes to claim His bride, we will experience the full depth of His perfect love and realize why our faith and hope were not in vain. Christ’s presence will be overwhelming, His purpose so obvious, His love so completely satisfying, that all doubts will be stilled and all longings fulfilled.